Google has been known to hide some Easter eggs in their applications and websites from time to time (like their Google Images Atari Breakout). But they’re not alone – programmers and web developers love to hide special features in their code. The same holds true for video game developers. I recently decided to blow the dust off of an Xbox game from 2009, Borderlands. Picking up where I left off years ago, I took it upon myself to explore the game map where I stumbled upon something all too familiar – a QR code. Scanning it with my phone, the QR code read, “JOSH WILSON HO OH”…What’s the point in that? Typically, finding these hidden treasures leads to some type of reward – something fun, something worth telling others about. But outside of this post, I’m not telling anyone to scan that QR code. This game missed out on a great Easter egg, one that could have been a great marketing gimmick for them. While today’s smartphones can read QR codes, their camera isn’t set up to automatically read them – they have to be told when to search for them. In other words, people need a good enough reason to download a QR code app and use it to scan the code. QR codes work perfectly for coupons, event registration, gathering additional information on the go, and the likes. Borderlands could have (and should have) used this opportunity to provide additional content downloads to those who took the time to scan the code. The video game community is filled with people talking in forums, blogs, reviews and other channels. In fact, there are articles that rank the top video game Easter eggs of all time. If Borderlands had their QR code scan to the directions that lead to a code for additional content – like new, in-game items or a hint at a future game in development – they could have made the list. Easily. Unfortunately, they dropped the ball on this one. I was a bit disappointed with the outcome, but this was definitely a unique approach to using QR codes. With barcode scanning technology in our pockets (thanks smartphones), QR codes offer yet another way to drive business and get people talking – if used correctly. What other creative and unique ways have you seen QR codes being used? Let us know on Facebook or on Twitter (@LTronCorp). 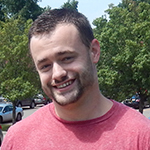 Jason Shanley is a member of L-Tron’s content creation team. His background in communication and technology provides him the deep knowledge base required for the articles he authors. Jason can be reached at info@L-Tron.com or (800) 830-9523.